How do I put filament into the UP! Mini 2? 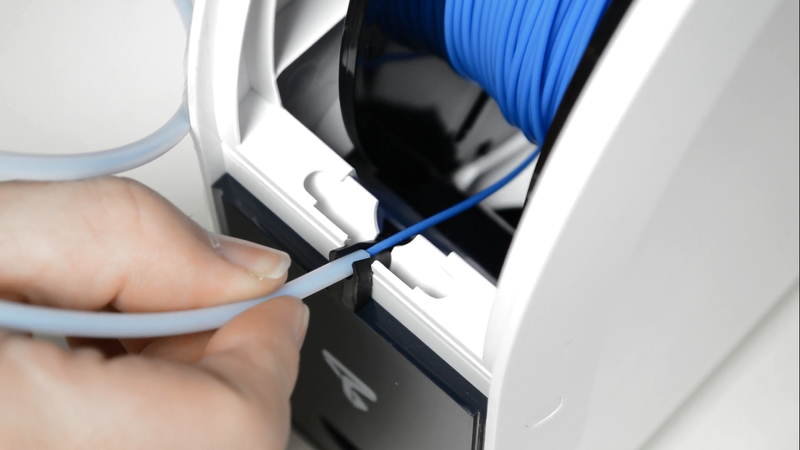 This article explains the process of putting filament into your printer. IMPORTANT NOTE: The UP! Mini 2 comes with a free roll of ABS in the box. This is a toxic plastic that can be difficult to work with, and is not recommended for use in a school. If you're at the stage of putting some filament into your printer, it's important to double check what type of filament you have. For a school environment, it's best to use PLA plastic. The type of plastic should be written on the side of the roll. 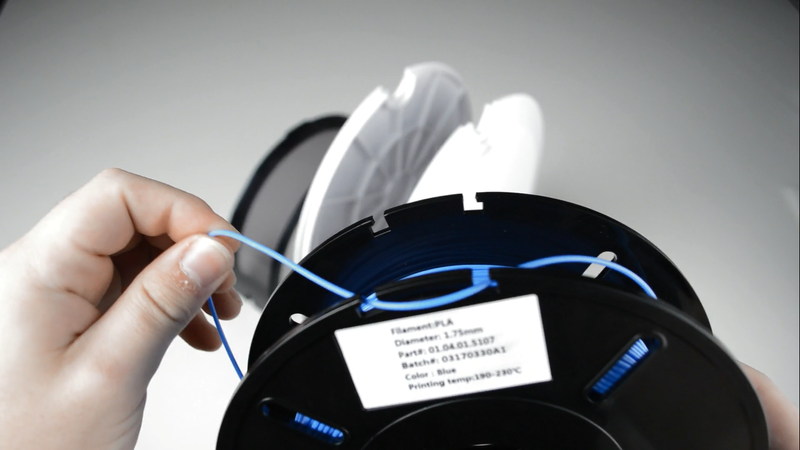 Once you have your roll of filament, release one end from the hooks or holes like so. NOTE: If you are removing filament from the printer, never let go of the end and always push it through the holes or hooks on the roll. This will stop it from unravelling and tangling in future. Then, simply remove the lid of the filament caddy and drop you roll in like so. 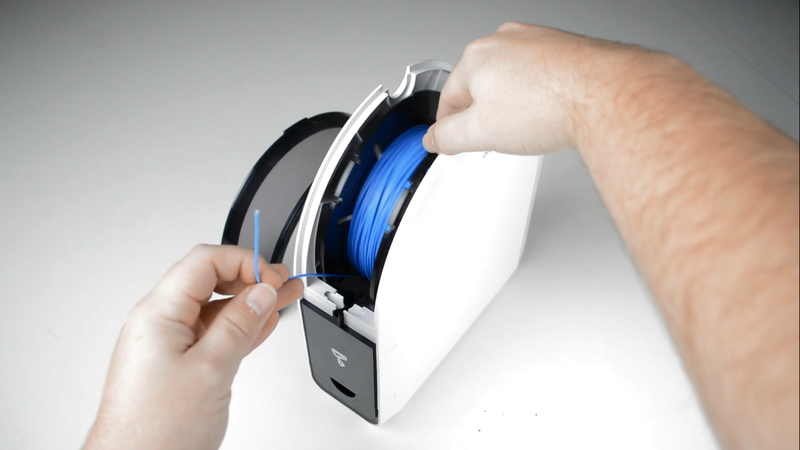 Locate the white tube, and feed your filament through like so. There should be about 10cm of filament poking out the end. 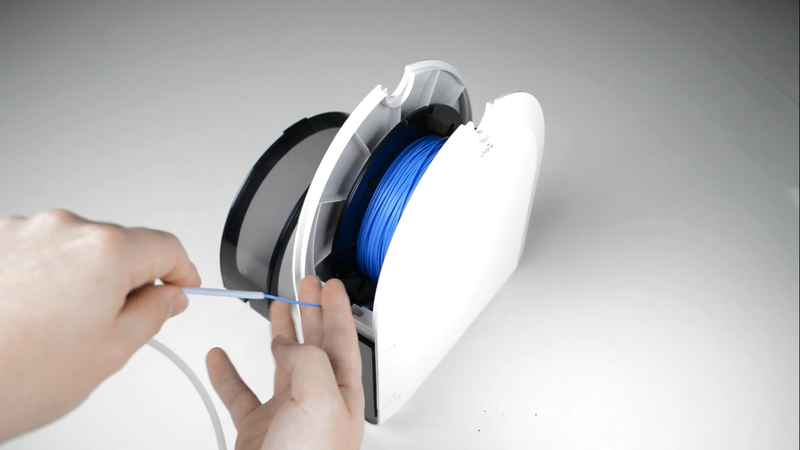 Then, push one end of the tube into the rubber grommet on the filament caddy. Put the lid back onto the caddy, and should look like this. Next, you need to remove the two top panels of the printer. The easiest way to do this is to open the front and back doors, and simply push up against the top panels. They're held on with magnets, and so will pop out when pushed. 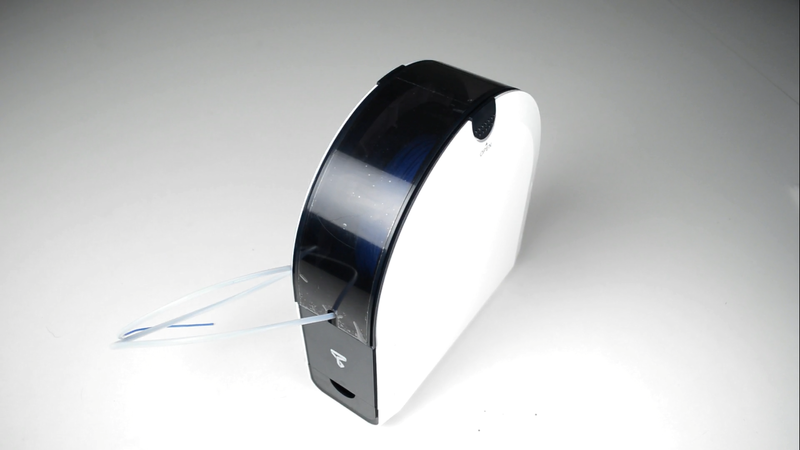 Next, position the caddy at the back of the printer and feed the tube through the small hole on the back door. You can then pass it under the black bar also. Then feed the filament into the hole on top of the extruder. This can be a bit tricky, and you may need to gently bend the filament to get it to go in vertically! 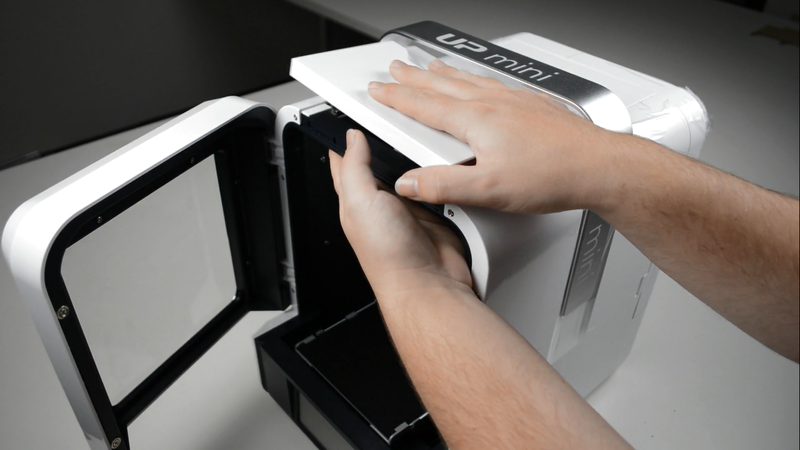 At this point, you have two options: use the LCD on the front of the printer; if there is no computer connected, or simply use the UPStudio software while connected to the printer. Then, you will need to tell the printer what type of plastic you are putting in. You can find this information written on the side of the roll. For school use, we recommend PLA. In the drop down menu titled 'Type', select 'PLA'. Then type in the weight of the roll in the 'Weight' section. Most rolls are 500g. 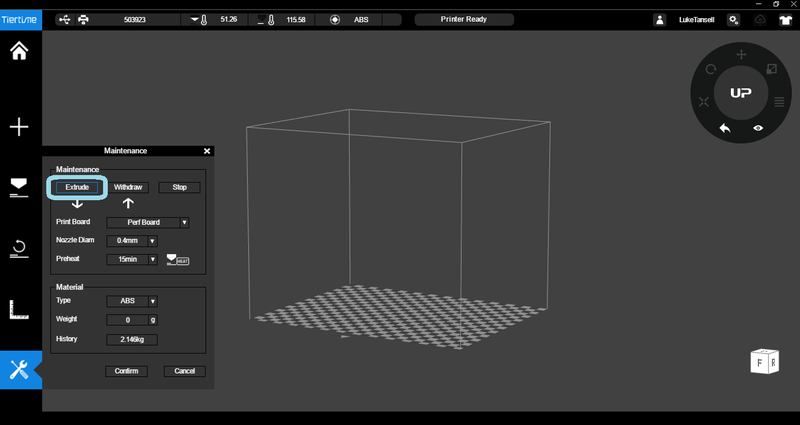 At this point, you can click 'extrude' at the top of the menu and the printer will start heating. It will take a few minutes to heat up, and will eventually beep. Sometime the filament won't automatically feed in, so you may need to put a little bit of pressure on it like so. Once filament starts coming out of the nozzle, it will keep going for about a minute. This is to try and wash out the previous colour of plastic. 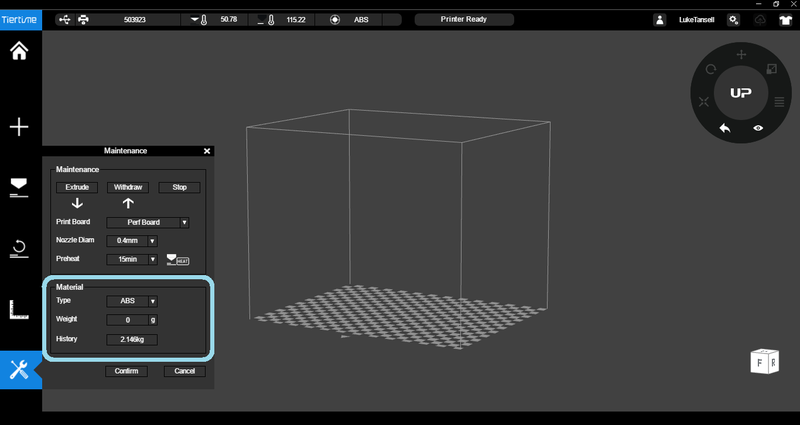 If the colour hasn't completely changed, feel free to click 'extrude' once more. Then, you can click 'confirm' and you're ready to go!